Most tourists who travel to Thailand will get a 30 day visa on arrival stamped in their passport. In exceptional circumstances a 10 day extension can be granted. However, this is not normally the case. If an extension is granted the cost is 1,900 baht and the process can be very frustrating. From Koh Chang, Hat Lek (Koh Kong on the Cambodian side) is the nearest border crossing. The crossing at Hat Lek is not normally busy and getting the relevant paperwork completed takes about 30 minutes. A return trip from Koh Chang to Hat Lek takes about 6 hours. 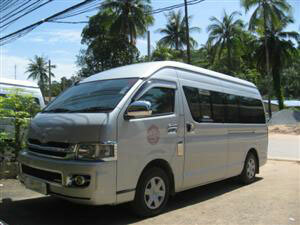 This includes the Koh Chang to Trat ferry crossings and a short lunch break at Hat Lek. Doing your Visa Run from Koh Chang means that you can leave at a reasonable time in the morning and get back in time to soak up some afternoon sun on the beach. Our minibuses will pick you up from your hotel at about 8.30 in the morning and drop you back at your hotel for about 4.00 in the afternoon. Due to Aranyaprathet being such a well known border crossing it also gets very busy (many agents from Bangkok use this crossing for visa runs) and getting the paperwork completed can take some time. Tourist visa's obtained prior to a stay in Thailand can be used to stay for up to 30 or 60 days, depending on the visa applied for. These visas can be extended for 30 days at immigration offices throughout Thailand. The fee is 1,900 baht, again the process can be very frustrating. Instead most travellers choose to do a Visa Run to the Thai-Cambodian border crossings. The most renowned border crossing is Aranyaprathet (Poi-Pet on the Cambodian side). The cost for a visa is 1,200 baht for the Cambodian visa and 350 baht for an exit stamp. The exit stamp has to be paid if you are leaving Cambodia on the same day that you make your visa. Travellers without visa will, from December 2008, get only 15 days of stay if they are arriving via a land border checkpoint from a neighbouring country. If you require a longer stay you should Contact Us so we can discuss the options available to you.